The entire team at the ibis Styles Nancy Sud Houdemont hotel welcomes you. When passing through the Lorraine region, don't forget to visit Place Stanislas where you can sample bergamot candy and Nancy macarons. Pierre Husson, Hotel Manager. 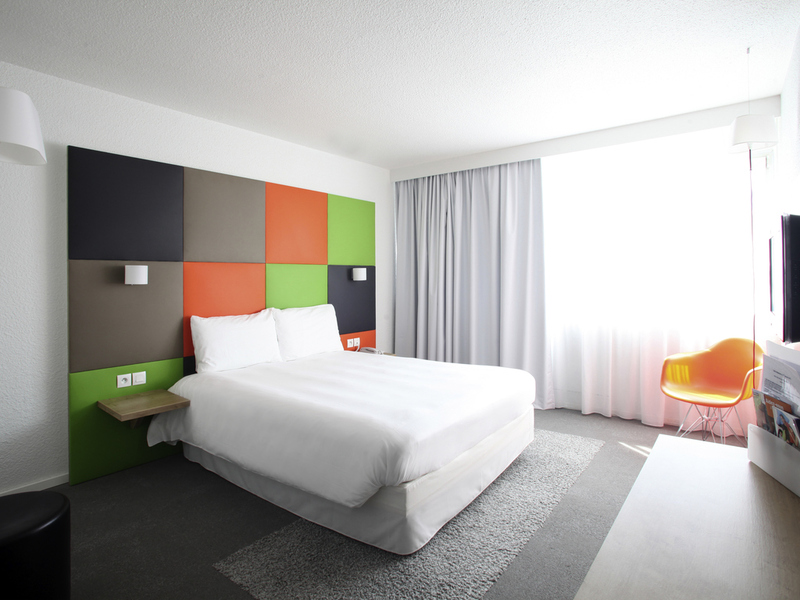 Easily accessible from major highways, ibis Styles Nancy Sud hotel features 86 spacious, modern, peaceful and air-conditioned rooms. Over 3229 sq. ft. (300 m²) of modular meeting facilities for your seminars, cocktail parties and family events. Restaurant serving traditional cuisine. Bar, terrace, outdoor pool and park with trees. Family rooms and play areas for children. Breakfast and unlimited WIFI included in all prices. Free private parking for 150 cars. Houdemont, an old wine-growing village, is full of treasures: 18th-century castles, a wash house, as well as commercial areas for shopping and food. There's lots to explore for every itinerary and taste! 15 minutes from Nancy, renowned for the Place Stanislas and its 18th-century architecture, which is listed as a Unesco World Heritage Site. The Musée Lorrain, the Musée des Beaux Arts and the Musée de l'Ecole de Nancy are full of wonders. RMC Sports and Eurosport screened at the bar for all football matches. I thought the sheets were a bit rough. The hotel was well located, with decent rooms a great breakfast, and friendly staff. Perfect for a stopover on route back from the Italian Alps. The problem for us was thehalf board dinner options. It was not clear that children are extra, seems odd to book 4 people in a half board room, but only include the food for adults! When it came to dinner the menu was ridiculously limited, mains were a choice of two salads, or a fish dish. This needs to be rethought, anyone choosing this option will feel let down, either don't offer it at all or offer a reasonable choice. Thankfully we hadn't prepaid so we cancelled dinner and went elsewhere. We'd happily stay here again, just wouldn't bother booking half board. Everything was perfect, only issue being that the atmosphere in the room is extremely dry (encountered several times staying at this hostel) and thus even whilst turning off the airco. So awake very thirsty at 4AM. And last but not least, price is quite expensive so will most likely need to reconsider for future stay in the area. Friendly welcome, comfortable bed, good shower pressure, wi-fi reception good, quiet despite being close to motorway, very good evening meal and breakfast. Nice hotel with friendly and professional staff. I have been at this hotel many times before and always had a positive experience. Wonderful comfortable stay in the hotel. Very good overnight stop. Limited menu in the restaurant but served well.Great members of staff throughout the hotel from check in to departure. Rooms clean with comfortable beds. Would recommend for an overnight stop. MENU IN RESTAURANT IS ONLY IN FRENCH AND FOOD IS POOR .CHEF COULD NOT EVEN MAKE A PLAIN OMELETTE INSTEAD OF WHAT WAS OFFERED. AS ABOVE AND RECEPTION STAFF NOT AS COOPERATIVE AS ON PREVIOUS VISITS. WE USUALLY STAY 10 TIMES A YEAR AND HAVE YET TO ENJOY A GOOD MEAL. ROOMS ARE CLEAN AND COMFORTABLE BUT THE TOILET AND BATHROOM BEING SEPARATE IS VERY INCONVENIENT, ESPECIALLY FOR MY DISABLED WIFE. ALSO THERE IS NO BIDET. I ALWAYS EXPLAIN MY WIFE`S MOBILITY PROBLEMS WHEN BOOKING BUT THERE IS OFTEN NO NOTE MADE ON THE COMPUTER. NO=ONE CAN TELL ME HOW MANY POINTS I HAVE AS A MEMBER AND HOW MANY POINTS I NEED FOR A FREE NIGHT`S STAY. I HAVE USED IBIS ACCOMMODATION FOR OVER 20 YEARS AND AM VERY GLAD TO SEE THAT YOU HAVE PUT &quot;TOPPERS&quot; ON YOUR VERY HARD BEDS. A GREAT IMPROVEMENT!I WOULD APPRECIATE A REPLY ON HOW YOU WILL ADDRESS MY COMPLAINTS. A great location for an overnight stay on the way to the Swiss Alps. Clean & comfortable with excellent team on reception and in the restaurant. Stayed many times previously and always been satisfied with the experience. Easy to find, clean and well run hotel. Friendly staff with an amazing chef who kept his cool in a kitchen that everyone could see into, and still produced an excellent evening meal. A perfect overnight stop on the way to or from southern France. Reception and restaurant staff were very friendly and helpful. Nice welcome. This was just an overnight stop and the hotel always looks after us. Friendly staff and a nice hotel for an over night stay. Sorry I rated this so low, but I wanted to get your attention. I love Ibis because the rooms are perfect and very clean. Why, then, do all the Ibis hotels have super clean rooms, but then very old, very dirty paper advertisements are put on the bed? At every single Ibis I know, these printed adverts are old, crinkled, and disgutingly filthy. My routine is to check in, step into my room, remove these disgusting things, hen promptly wash my hands. Adds no value whatsoever, and I have never even read them. p. p. p. stop this stupid filthy disgusting practice you do at ALL Ibis hotels. Friendly service; good dinner and breakfast; decent room. The outdoor area, swimming pool etc are a nice touch, even if we didn't personally use them.